gaming stations to U.S. children's hospitals. Well before his problems with post-concussion syndrome eventually brought his Hall of Fame career to a premature finish, Pat LaFontaine used to spend hours in hospitals visiting children who needed a friend or needed a reason to smile. It was during these times that LaFontaine began to realize what his true mission in life really was, and it had nothing to do with sticks, pucks or gloves. While he was paid to score goals, dish out assists and help his team win games, LaFontaine realized his future was in charitable work aimed at helping sick kids. Playing in the National Hockey League gave him a running start to fulfilling this ultimate goal. "There is nothing more gratifying to live out a dream and have great experiences, but then to use those experiences to help others, and use those friendships you made with people that are in position to make a difference to put it all together," LaFontaine told NHL.com Thursday. "It doesn't get any better than the Hockey Hall of Fame, but there is nothing more gratifying or more personal or more important for anybody than to give back to others who need it, especially kids." LaFontaine does that through his groundbreaking Companions in Courage Foundation, which is setting the standard for charitable work through its technological advances inside children's hospitals. On Wednesday, Companions in Courage announced that it had teamed with Microsoft Corporation as the distributor of 400 mobile Xbox 360 gaming stations to more than 100 hospitals throughout North America. The idea is to bring patients at various children's hospitals together in cyberspace, and perhaps connect them with their heroes as well. In an exclusive sit-down interview with NHL.com, LaFontaine explained the Xbox endeavor and how his charitable work has become his true passion. What follows is a Q & A with LaFontaine. The answers are long, but telling of LaFontaine's passion. If he was your hockey hero as he was to so many, you don't want to miss this. NHL.com: Can you just explain a little further about what Companions in Courage is doing these days? 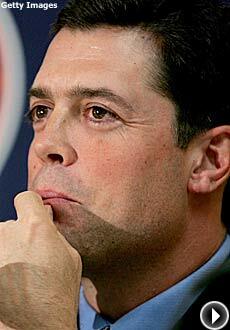 Pat LaFontaine: "We have been building these Lion's Den rooms, which are safe havens for kids to escape to. They have this great feel to them when you walk in and only kids with a special key can get in. No doctors. No nurses. It's a safe haven where they can go play Xbox 360. They have computers and plasma screens with age-appropriate movies already downloaded. They have this cool video conference pod that allows them to talk to their heroes, their teachers, their grandparents. They are these really cool rooms, just awesome. The exciting thing about it now is Microsoft just helped us launch these Xbox 360 kiosks. The kids that can't go to a Lion's Den room – if they can't leave their rooms or are being prepped for surgery – we can now bring these 360 kiosks to them and they're still connected. For the first time ever, we have created this online private gaming network. Microsoft is building over 400 of these machines for us. We have contacted all 30 NHL teams to see if they're interested in getting these kiosks for their local affiliated children's hospital. The great thing about them is they have these little cameras on them so that on occasion a celebrity can say hello, have a little chat, and play a game." NHL.com: Where did this launch and who helped in the launch? PL: "(Wednesday) we launched at New York's Columbia Presbyterian in the Morgan Stanley Children's Hospital, the Children's Hospital of Orange County in Anaheim, and the Seattle Children's Hospital. We had celebrities and athletes that lent their support of the project. In New York we had Susan Sarandon (actress), Michael Imperioli ("The Sopranos"), Michael Lombardi ("Rescue Me") and Dr. Mehmet Oz ("Oprah"). In Anaheim it was great because Scotty Niedermayer grabbed Brad May and Todd Bertuzzi and went out there to play games with the kids. In Seattle we had Marcus Trufant, the Pro Bowler (Seattle Seahawks), and Jeff Nelson (former Major League Baseball player). All of us were playing games with kids live at the same time under this network. The beauty is that it's only going to grow. These kids are now on this private gaming network. It's never been done. It will just connect other kids in other children's hospital, or they can play a game with an athlete, a hero. It can also be a stand-alone unit as well because there are two controllers. I'm amazed at the technology. Our hope is throughout to bring these machines throughout North American and then build more Lions Den rooms." NHL.com: Any great stories relating to the kiosks yet? PL: "The first day I went in, Ted Nolan, Rick DiPietro, Jim Craig and Rob Burnett from the David Letterman Show were playing games. One of the boys was Connor, who is 16 years old and going through a tough time. His mom, who had tears in her eyes, told me; 'Pat, I can't thank you enough.' I said; 'All the kids should have these kiosks and Lion's Den rooms in their hospitals.' She said; 'We were here two years ago when this wasn't here. I've been watching my son, every eight to 10 minutes he presses his pain medication, but for the last 45 minutes he hasn't touched it.' I said; 'That's why we're here.' We're here to give these kids an escape, a distraction, maybe to let them feel a little bit better about talking to another kid in another children's hospital who may be going through something similar. What better thing to do than use technology, and use what you have done in your life to make a difference in a child's life." NHL.com: When you started this, could you have envisioned technology making this big of a difference? PL: "We were told that and we had heard about it, but now we're starting to see it happen. We just thought maybe some video games and interaction. I had met some special kids. There was this really special one named Robert. I would go to his room in isolation in the early '90s. We played video games. Really, the impetus for starting the foundation is the nurse grabbed me one day and said; 'Thank you for coming to play video games with Robert.' I was like; 'He's my friend, I'm having fun and this is great. This is the least I could do.' She started crying and saying; 'No, I don't think you get it. This is the only time this boy smiles.' I never forgot it. Robert passed away six months later and I speak to his parents to this day. His mom is so excited. She only wishes Robert could have had this machine. There was another young boy named Eric, another one of those special, courageous young boys. Eric was fighting cancer. He used to call me and say; 'Hey, you have to get me a goal and an assist tonight.' It was an order. I tell you, nine times out of 10 it inspired me somehow to fulfill that order." NHL.com: How far can this endeavor with Microsoft and the Xbox systems go? PL: "We say 'on occasion' now a child can talk to a celebrity or a hero, but our hope is to talk to the 30 NHL teams and other sports and say; 'Let's put a kiosk in your clubhouse.' Any time there is downtime any one of the local players can go on. It could be; 'Hey, this is Sidney Crosby. I have a half an hour. Is Tommy out there in Seattle? The last time you beat me. Let's play.' He'll be able to talk to the kids in a very cool way and play a game. I mean, how cool is that? Technology is great. Who would have thought it could be a healing element." NHL.com: When you started it, could you have imagined Companions in Courage would turn into something this big? PL: "I was hoping. I wrote a book, Companions in Courage, and that just evolved into this foundation. There are no coincidences in life. My wife Marybeth and I started the LaFontaine Foundation back in 1997-98 with a bunch of Microsoft stock, and that was worth some money back then. That's how we started it, and we just partnered up so it transformed and evolved. That's the neat thing, it has just evolved and taken on a life of itself. How lucky a person am I to have three healthy kids, a great wife, to have played the game I love for 15 years in the National Hockey League, and because of that I'm able to do the things I love to do now. I can be around my kids and create this foundation to have an impact through a great team of people with courage. To make an impact on a daily basis for kids going through tough times is a great thing, and I'm very proud of it." NHL.com: OK, I'll ask you a question that maybe you can't answer: What is more gratifying, being elected to the Hockey Hall of Fame, or the press conference (Wednesday) launching this new initiative with Companions in Courage? PL: "By far (Wednesday). Hey, listen -- I wear this Hall of Fame ring with the utmost respect. It's a very exclusive club and I am so honored and I pinch myself everyday, but at the end of the day they're not going to ask me how many goals I scored or how many assists I got. They're going to ask me; 'What did you do with your life?' I believe that everybody's time machine goes off at a different time, and maybe in some cases you have to be hit in the head – no pun intended – but when you come to that reality you ask yourself why? Why did I play this game? What have I acquired in my life? I believe that every step of the way is to prepare you for the next step, and ultimately when people get to a point in their lives where they say; 'I have learned so much from these experiences,' it kind of guides you into what you are going to do next." NHL.com: One last question, and I would be remiss if I didn't ask it: You're a Hall of Famer, and I'm sure people want to know who you are rooting for in the playoffs? PL: "I'm a New York State kind of guy and so I automatically will root for those alliances and allegiances having played for all three teams in New York. I will always root for New York. I will say, though, out west and I picked them from early on, I like Colorado with those additions. I know, people say; 'But you're from Michigan.' You know, San Jose, it looks like they got over that hump. I like Dallas with Mike Modano, and I'm happy for Jeremy Roenick. But the additions of (Adam) Foote, (Ruslan) Salei, (Peter) Forsberg, (Ryan) Smyth, and Scott Hannan … if they get goaltending they will be a dark horse. I'm excited for that series."